I have a cat alhamdulillah and this precious cat of mine teaches me so much. Every single time she breathes and I see her body slightly heave upwards/downwards, I feel the need to praise Allah. When I watch her and she cleans herself by licking with her wittle pink tongue, I feel the need to praise Allah. When she meows with her soft and angelic voice, I feel the need to praise Allah. When she walks or runs like a leopard, I feel the need to praise Allah. When she is peacefully asleep and her eyes are closed but she’s still breathing, I feel the need to praise Allah. When she rolls over out of joy, I praise Allah in joy. My cat is a creation of Allah. A living existence that proves there is One who created everything. I couldn’t be happier when I see my beloved cat. Every structure of her body is perfect because it was made by Allah (s.w.t.). Her eyes, like every cat, was created so that she could see in the night. In the night, one can see her eyes shining and we like to say that it’s because her eyes are filled with noor. 😛 Not only that but cats purr and there is evidence that heals broken bones and such. I’m not sure if that’s completely true but ain’t that awesome? Allah even made cats such pure and clean animals. My cat constantly licks herself clean. People even believe that Muhammad (s.a.w.) drank from the same water a cat drank from! Dawud ibn Salih ibn Dinar at-Tammar quoted his mother as saying that her mistress sent her with some pudding (harisah) to Aisha who was offering prayer. She made a sign to me to place it down. A cat came and ate some of it, but when Aisha finished her prayer, she ate from the place where the cat had eaten. She stated: The Messenger of Allah said: It is not unclean: it is one of those who go round among you. 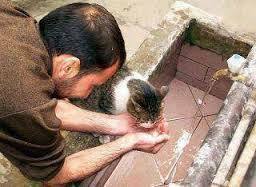 She added: I saw the Messenger of Allah performing ablution from the water left over by the cat. Every creature or animal is a creation of Allah. How can we ever torture or be cruel towards a creation of Allah? So be kind to all creatures including cats because they are truly amazing. Love every creation of Allah. You don’t know what one act of kindness towards a creature will do. Don’t abuse or ignore animals. You don’t what one act of cruelty will do. It could be a matter of heaven and hell. Seriously.